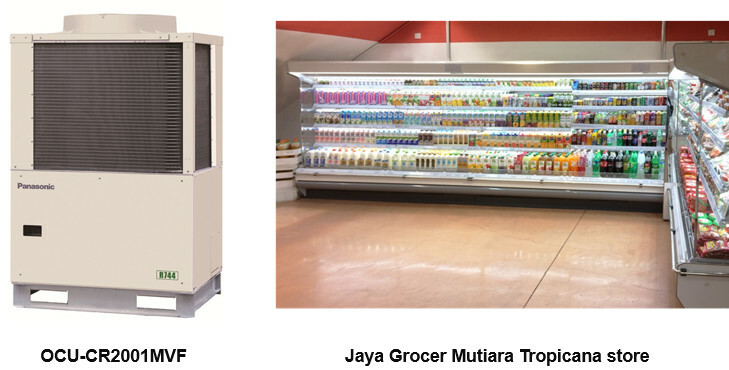 Osaka, Japan, 8 May 2017 – Panasonic Corporation announced today it has supplied its CO2 refrigerant-based condensing unit to the Mutiara Tropicana store of Malaysian supermarket chain Jaya Grocer as its first supermarket customer for such systems outside Japan. Panasonic Commercial Equipment Systems Co., Ltd., a subsidiary of Panasonic Corporation, developed the fluorocarbon-free condensing unit and supplied through its local sales agent Coolcare (M) Sdn. Bhd. It was assisted with the funding provided under the Multilateral Fund for the Implementation of the Montreal Protocol by the Department of Environment of the Ministry of Natural Resources and Environment of Malaysia (NRE). Jaya Grocer is the first supermarket chain outside Japan to adopt Panasonic's environment conscious commercial condensing unit..
Supermarket and convenience store operators are faced with the challenges of cutting power consumption of refrigeration and freezer systems in their stores as well as reducing environmental impact from the refrigerants used in such systems. Amid growing awareness of greenhouse effect of fluorocarbons, CO2 refrigerant is drawing attention as a next-generation refrigerant. Compared to hydrochlorofluorocarbons (HCFC) and hydrofluorocarbons (HFC) currently used in most stores, natural CO2 refrigerant has an ozone depletion potential (ODP) of zero and the extremely small global warming potential (GWP) of 1/1,430 to 1/3,920. Panasonic started verification testing of fluorocarbon-free condensing units using CO2 refrigerant in 2009. Since September 2010 to date, the company has supplied around 6,000 units to Japanese retail companies, while promoting its environmentally friendly condensing units in other countries. Malaysia, which has ratified the Paris Agreement, is tackling the global warming problem at a national level, with the government and private sectors working together to phase out the use of fluorocarbon refrigerants. As part of these efforts, Panasonic’s CO2 condensing unit was recognized by the Malaysian government as a technology that helps mitigate climate change. Also taken into consideration in determining the subsidy eligibility included the company’s track record in supplying natural refrigerant condensing units to supermarkets and convenience stores in Japan, its high share of supermarket display cases in Malaysia, and its active involvement in the promotion of natural refrigerants. In Malaysia, Panasonic is also involved in activities to spread the use of natural refrigerants through fostering a better understanding of them. On March 23, the company held a seminar on fluorocarbon-free condensing units for local university faculty and construction personnel in cooperation with NRE. Panasonic will continue to support the country’s efforts against global warming by offering its technology and experience in this area. 1. Refrigerant: These are thermal catalysts (fluids) that exert pressure in freezers and other devices to absorb heat continually from low temperature areas and convey it, then discharge the heat to high temperature areas. They are used for cooling in air conditioners and display cases. There are various types of refrigerants made by manufacturers of such.Currently the most popular refrigerants used in freezers are hydrofluorocarbons [HFCs (R410A, R404A, etc. )], alternatives to CFCs that have high energy-saving properties and zero ODP. However, their high GWP has led to a shift to natural refrigerants in recent years. 2. Condensing unit: Heat source equipment for display cases. Like the outdoor unit of an air conditioner, these are often placed outdoors, and connected to the in-store display case or other device by a pipe. The pipes carry the refrigerants. 3 Top flow: Types that expel the waste heat from the top are called top flow types, those that expel the waste heat from the side are called side flow types.